But, I do occasionally have cooking disasters. This is one of those times. Wrong – The fudge filling hardened very quickly, and was difficult to spread; AND, the cake base broke into pieces when I tried to roll it. The one good thing about this recipe is that it was very tasty – even though it didn’t look very nice. Preheat oven to 375° F. Put butter, sugar, eggs, milk, and vanilla in a mixing bowl, and stir together. Add flour, baking powder and salt; beat until smooth. Put batter on a 15x10x1 -inch baking sheet that is lined with parchment paper. Make sure that the batter goes to the edges and corners of the pan, and that it is spread evenly. Bake 12-15 minutes, or until toothpick comes out clean. Remove from oven and turn upside down on a piece of parchment paper that has been covered with sugar. Peel off the parchment paper that was used when baking. 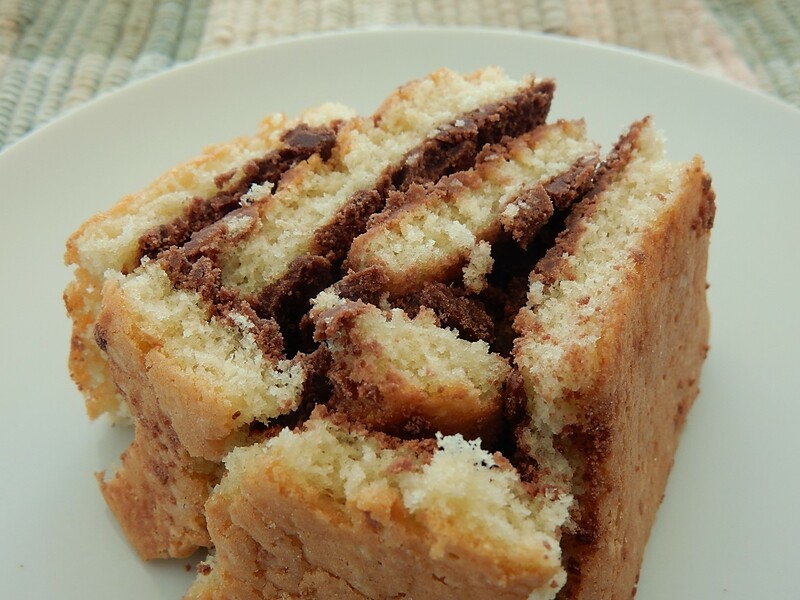 Immediately spread with the fudge filling, and roll as for a jelly roll. Melt butter using medium low heat in a saucepan, add cocoa and stir until smooth. Stir in sugar, salt, and milk. Increase heat to medium, and bring to a boil while stirring occasionally. Immediately remove from heat, and add vanilla. Beat until smooth, and spread on cake base. Note: This icing hardens quickly. Immediately spread as soon as it reaches a spreadable consistency. Posted on March 24, 2019 March 22, 2019 by SherylPosted in FoodTagged cake, recipe. Oh dear. I wonder who or what Runkel was? 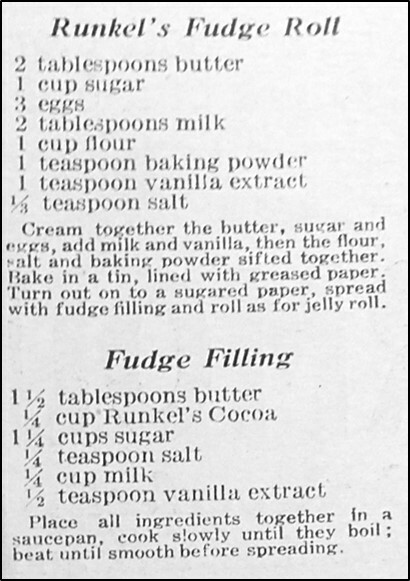 Runkel Brothers were among the major chocolate manufacturers during that time period. Oh, thanks. I wonder if they’re still around? I’m not positive, but I think that the company is long gone. Some of the sorriest looking messes I ever made were quite delicious! I am experimenting with roasting vegetables in the oven right now. I know that I have departed from the instructions a lot but starting to smell wonderful. However what it will be another story. Thanks for the recipes. They are appreciated. I’m from the school that renames disasters. I think I would have called this Runkel’s Folded Fudge. I think that you identified some of the things that caused me problems. I hadn’t made a jelly roll in years, and had forgotten about rolling it in a powdered sugar towel almost immediately after it comes out of the oven – and then unrolling to add the filling. I just followed the 1919 directions which said, “Turn out on a sugared paper, spread with fudge filling, and roll as for a jelly roll.” I should have actually looked in a more modern cookbook (or online) and figured out that rolling as for a jelly roll means pre-rolling while still very warm. As for the filling – it didn’t seize. It just hardened very quickly when I began to spread it. I think that maybe I beat it too long, and as a result the filling was too cool by the time that I was spread it. It’s still better than some of the recipes I see. Random lists of ingredients with no real instructions. I’d make/eat that cake. I agree – there are some really strange recipes out there. I don’t think my Mom ever made a “good” looking cake, but they always tasted just fine. You’re making me feel better. I always want foods to look pretty when I photograph them for this blog, but that just didn’t happen this time. My first thought on seeing it was that it looked delicious. The cake looks moist, and kind of reminds me of the moist cake-like puddings common in European cooking. You’re absolutely right. A few cooking mishaps make the successes all the more special. Thanks for the reminder. Sorry it didn’t work out! But at least you gave it a try! Everyone makes mistakes! Thanks for the kind words. I’m starting to feel a little better about it. It was yummy – just not aestetically pleasing. My husband and I enjoyed it, but it was one of those recipes where I was really glad that I hadn’t planned to serve it to guests. Really loved reading this old recipe, Sheryl — calling the pan a “tin,” and using “greased paper.” And no use of a KitchenAid stand mixer to cream the butter and sugar in those days. Enjoyed this post, thank you, Sheryl. Old recipes provide a wonderful window into how terminology and cooking processes have changed across the years. Sorry to hear, but at least it was tasty! I learned the hard way that I should have rolled it first in a kitchen towel without the filling. I really wish that I’d taken the time to research how to make a jelly roll before I dove right into making this Fudge Roll. Thanks for the link. Your directions and the photos are really helpful (and the jelly roll looks absolutely wonderful). At first glance I thought this looks like a piece of something yummy! So, while it didn’t turn out as expected it does look delicious and glad that it turned out to be. Nothing worse than a failed recipe that doesn’t taste good. Yes, I think that you’re right. If I hadn’t expected it to look similar to a jelly roll, I probably would have been pleased with this dessert. To be honest- probably not. It’s a recipe that I should experiment with – since I think that I could do it much better if I made the recipe again and tweaked the process a bit; but the reality is that I’ll probably just move on to a different recipe as I work on my next post. Those desserts that you roll are hard to make. I swear they leave out some ingredients – something is off with those recipes. It’s good to know that I’m not the only person who finds rolled desserts challenging to make. I know that you and the others are right – taste is the important thing. Yet, in this age of food photography (and blog photos), it’s sometimes difficult to keep this in perspective. Thanks for the reminder. Thank you! You are being very kind. At least it was tasty. I’d be interested in a compilation of those recipes that you love and make quite often. A linkfest would be a good way to do it. Each spring I make Baked Rhubarb with Orange several times. Another favorite is Lamb Curry and Rice. And every year for Thanksgiving I make Cranberry Conserve. Until I read your comment I hadn’t thought about how the changing composition of the ingredients might affect the finished product, but now I’m thinking that may have been a part my problems. It sounds very tasty. Looks aren’t everything! How true- some very tasty foods don’t make the most beautiful presentations.